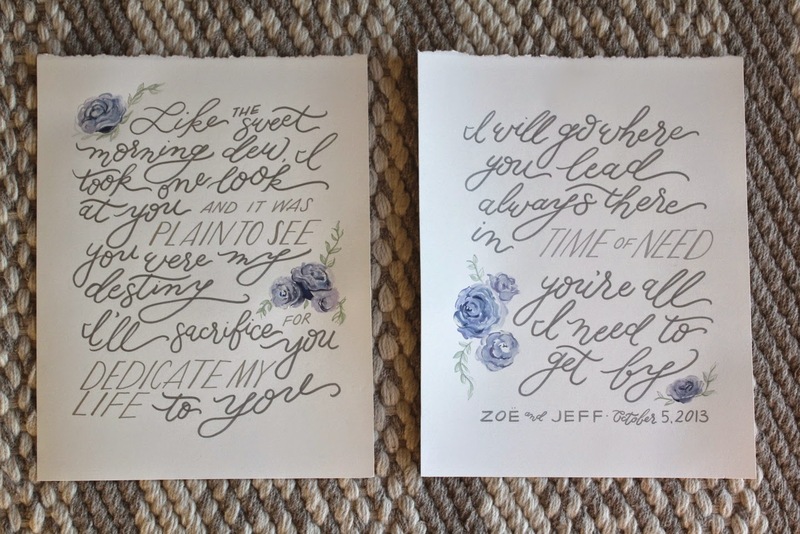 I am a big fan of gift giving, so before our first wedding anniversary in October, I put a lot of thought into what I wanted to give to Jeff. Something meaningful, personal, and preferably made of paper were high priorities on my list and I scoured Etsy for options. I hadn't found anything that I had to buy, until a former classmate shared a project that she had created on Facebook. 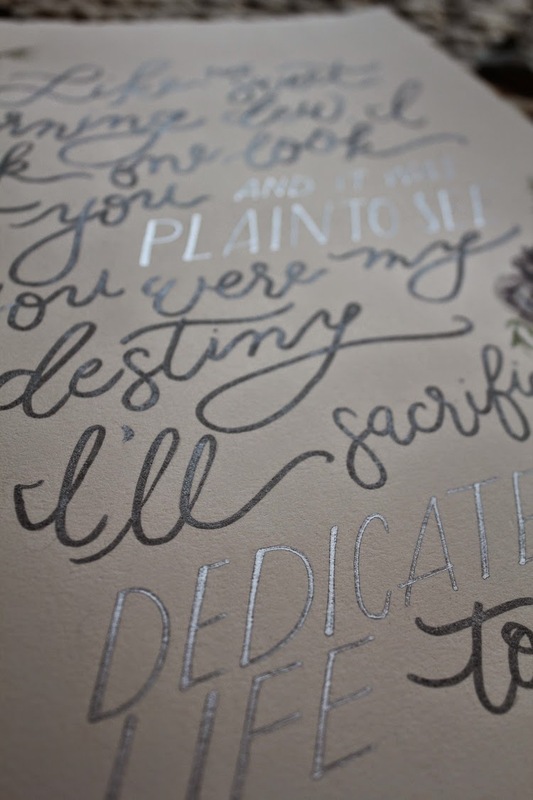 Jessica Crowell is a fellow Oregon alum who had recently started a new career as a letterer and illustrator. 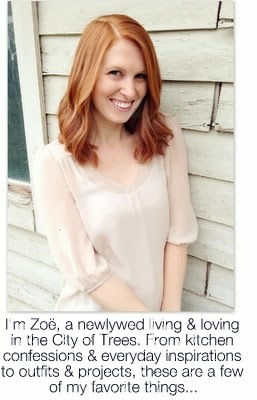 On my first visit to her website and blog, I spent an hour looking through all of her posts and I was sufficiently in love when I reached out to her to inquire about a custom piece of my own. 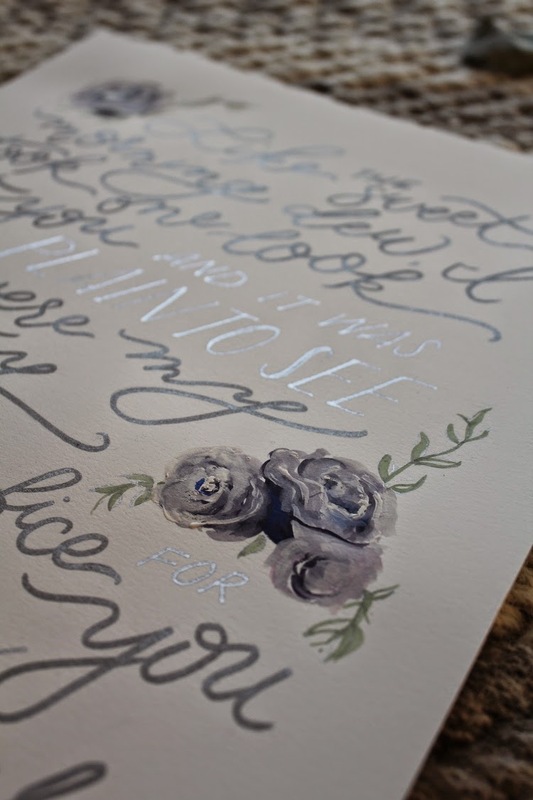 I knew I wanted to incorporate colors from our wedding or our bedroom - silver and gray with pops of either purples or blues - and the song "You're All I Need to Get By." In my opinion, a duet is a perfect wedding song. It incorporates two voices, two points of view, the two parts that make a whole. Marvin and Tammi sing about love, sacrifice, and inspiration, and the music is guaranteed to get your foot tapping. This song means a lot to me and my relationship with Jeff and I knew I would be happy to see the lyrics hanging in our home every day. We ended up settling on silver and blue to match our bedroom decor and as soon as I saw the depth of color and texture in the flowers, I knew it was the perfect choice. Jessica was immediately on board with whatever I wanted to accomplish. She had great ideas about how to include the most important lyrics, she was willing to experiment with colors and accents, and she was delightful through and through. She was efficient in sending me samples and answering my questions, and when she sent me her first draft, it was better than I had imagined. I don't think I've ever been so excited for a gift to arrive! 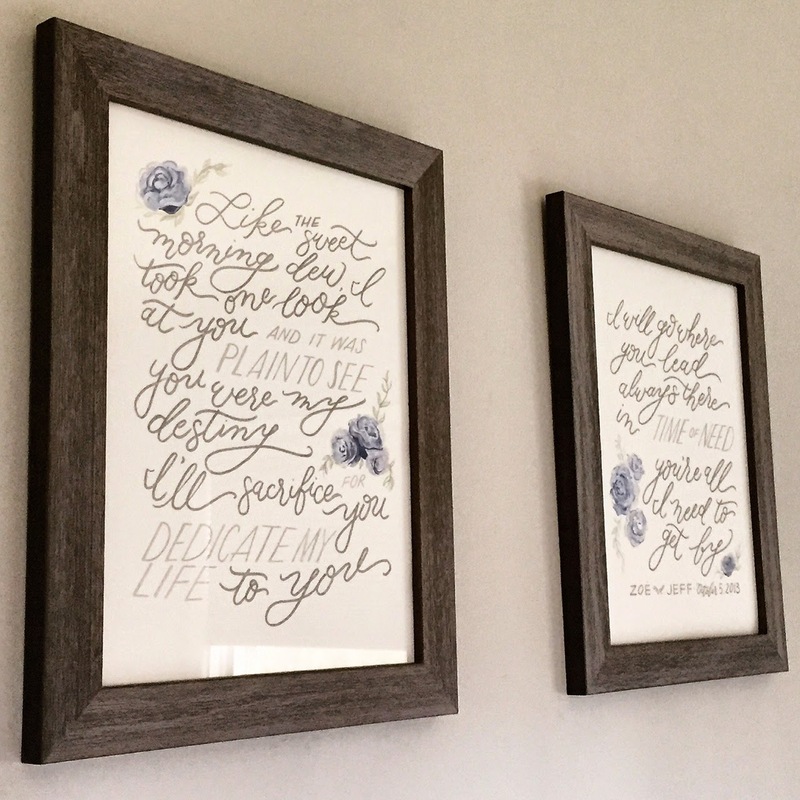 I found beautiful blueish gray wood frames at Michael's and presented these to Jeff on our anniversary getaway in McCall. They now hang over our bed and we admire them constantly. Thank you, Jessica, for this perfect gift! I highly recommend working with her on any custom projects.